First – If you have had a miscarriage, and that is why you have found this post, I am so sorry. Make sure to click over to my post on Emotional Healing After Miscarriage for ideas on how I managed emotionally after my losses. If you have found this post because you are pregnant and are fearful of miscarriage, please know that fear is normal. It will not harm your baby. Pray, pray, pray, pray, pray. Also, check out my post with ideas from me on how I managed fear and anxiety in pregnancy after infertility and miscarriage. I was raised Catholic, and I find great comfort in praying to the Saints. Knowing that there is someone special in heaven praying for me and advocating for me to Jesus is blessing. It doesn’t mean I can’t pray directly to Jesus . . . it just means I get a little extra special attention from someone who cares about me and my prayers. Check out all my posts on Saints and Fertility here! 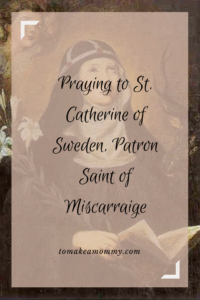 St. Catherine of Sweden is a great saint to pray to on your infertility journey, because she is the patron saint for those who have suffered a miscarriage, and for protection from miscarriage. Her feast day is March 24, and you can pray to her both for healing from miscarriage and for preserving a current pregnancy from miscarriage. St. Catherine was a Swedish princess and the daughter of St. Bridget of Sweden. She was married at age 13, but she and her husband both took mutual vows of perpetual chastity. Her husband died, and she followed her mother around Europe doing Christ’s work. During that time she worked with the poor and taught them life skills and Christianity. As her mother did, she counseled women who had suffered a miscarriage or illness during their pregnancy. There are prayers to her for both avoiding miscarriages, and for healing after a miscarriage. Both are shared below. *This post contains affiliate links which at no cost to you provide me with some small change to help keep this blog running! If you decide to buy something I recommend, please consider clicking through one of my links to help support this blog and my family! Thank you! Pray with her. Use the traditional prayers below or use your own prayers. Ask her to intercede on your behalf to Jesus. If you are nervous to pray your own words, check out my post on Asking God for a Miracle. Think of her consoling the poor women of Europe after their miscarriages, and know if you have had a loss, that she is consoling you and sending you healing love from Heaven. Wear a medal in her honor. Everytime you touch it, see it, or think of it, say a prayer to her! Tell people about her. Share her story. There is a special grace given when you tell others about Saints that are special to you. Celebrate her feast day- March 24th- with prayer and meditation. If you have experienced a miscarriage, there is a sweet and simple prayer to St. Catherine of Sweden asking for healing and consolation. Dear Saint Catherine, patron of those who have suffered a miscarriage, you know the dangers that await unborn infants. Please intercede for me that I may receive healing from the loss I have suffered. My soul has been deprived of peace and I have forgotten what true happiness is. As I mourn the loss of my child, I place myself in the hands of God and ask for strength to accept His will in all things, for consolation in my grief, and for peace in my sorrow. Glorious Saint Catherine, hear my prayers and ask that God, in good time, grant me a healthy baby who will become a true child of God. Dear Saint Catherine, you know the temptations of mothers today as well as the dangers that await unborn infants. Intercede for me that I may avoid miscarriage and bring forth a healthy baby who will become a true child of God. Dear Heavenly Father, I thank and praise You for the gift of all human life. I am most especially grateful for the new life within my womb – the unborn child forming deep within me. Through the prayers of Mary, Mother of Jesus, and the intercession of Saint Catherine of Sweden, I beg You to watch over and protect this little one inside my womb.